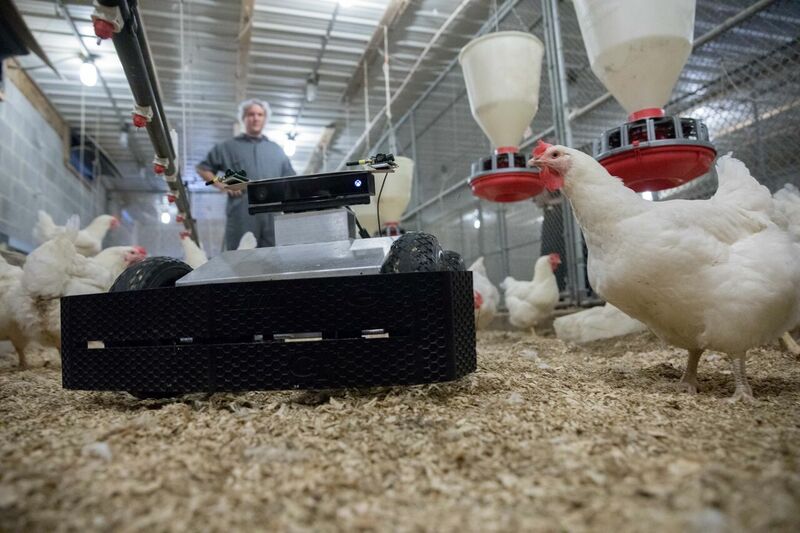 A new mobile autonomous robot could perform daily monitoring tasks while safely interacting with chickens in commercial chicken houses, according to researchers at the Georgia Tech Research Institute (GTRI). This advance could help farmers reduce the likelihood of disease outbreaks, lessen their labor costs, and allow them the freedom to take on more important tasks. The autonomous robot is outfitted with an ultrasonic localization system similar to GPS but more suited to an indoor environment where GPS might not be available. This system uses low-cost, ultrasonic beacons indicating the robot’s orientation and its location in a chicken house. The robot also carries a commercially available time-of-flight camera, which provides three-dimensional (3D) depth data by emitting light signals and then measuring how long they take to return. 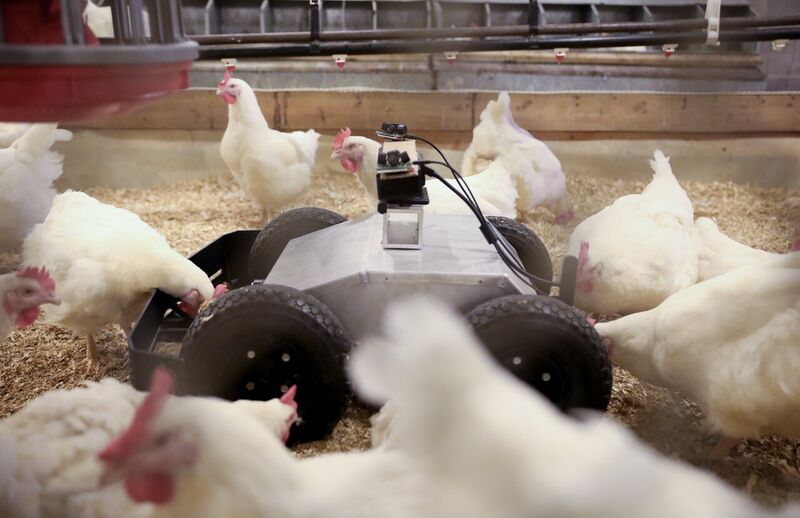 The localization and 3D data together allow the robot’s software to devise navigation plans around chickens to perform tasks. The research team, working closely with researchers at the University of Georgia, is preparing for a six-week field test in a small-scale grow-out house where the robot will interact with broiler chickens raised from chicks to maturity. “This field test would allow us to test our current navigation algorithms, see how robust they are, and improve them,” he said. 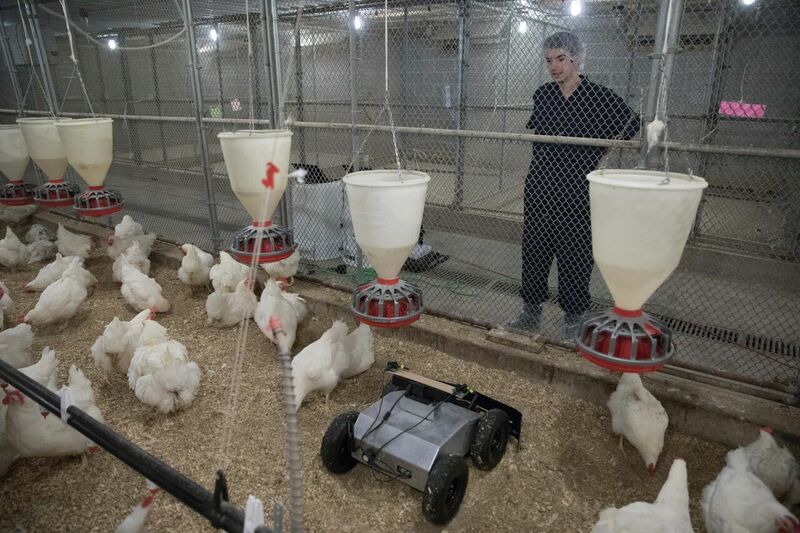 Later, the robot will enter a multi-month field trial so testers can learn how well it picks up floor eggs in a commercial size grow-out facility housing full-grown breeder birds. The robot will “wake up” periodically and navigate through the house searching for eggs. Its software uses deep learning to find and locate eggs and chickens and uses visual servoing – similar to a person’s hand-eye coordination – to control a robotic arm’s movement. In a real-time control loop, the computer receives successive images from a camera located on the end of the robotic arm aimed at the egg, guiding the arm closer and closer to the egg. The robot’s arm has a vacuum tip with a suction cup sensor that delicately picks up the egg and moves it to a basket. When the basket is full of eggs, the robot returns to a drop-off spot in the house, removes the eggs from the basket, and continues searching the house for more eggs to pick up. 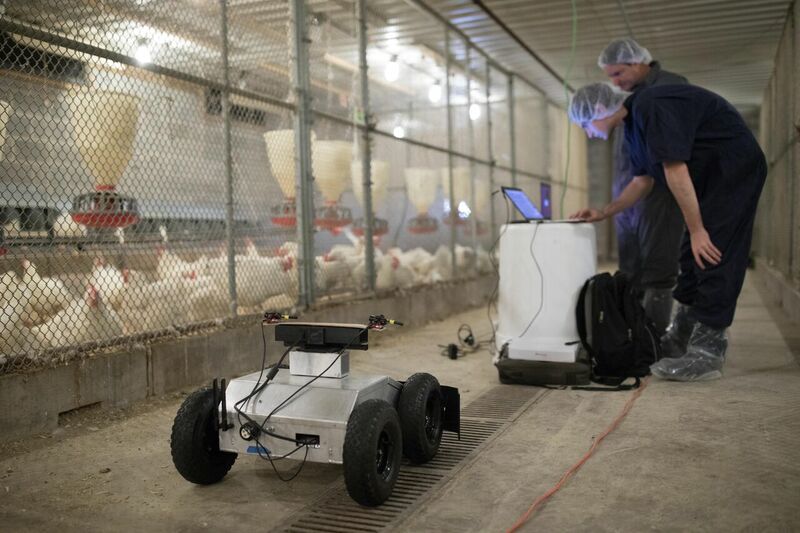 In addition to carrying out physical tasks, deploying autonomous robots could potentially decrease the chances of a chicken house being exposed to avian flu or other diseases and contaminants carried inadvertently by people. Ilan Stern, a senior research scientist with the Georgia Tech Research Institute, and colleagues, are collaborating on a $2 million project to build a 40,000-square-foot lighted outdoor footpath demonstrating applications of piezoelectricity for renewable energy. A two-armed robot named Tarzan, swinging along elevated cables could allow farmers to monitor fields continuously at lower cost while avoiding interference with plants.